Eye drops, fish oil tablets and punctal plugs: No, these aren’t garage bands you never heard of. They all treat the signs and symptoms of dry eye disease. So much sexier, right? Turns out, there are only two prescription eye drops approved for long-term use: Restasis from Allergan and Xiidra from Shire. Another Rx medication could soon give them a run for their money — Novaliq’s CyclASol, a clear, ophthalmic solution of cyclosporine entering Phase 3 studies. Dry eye disease can be complex, so the good news is there are a wide range of options available depending on the severity. Whatever your preference or your patient’s needs, there is a solution that works. If a patient comes in with symptoms of dry eye we start with a prescription for eye drops like Restasis or Xiidra they can pick up at a pharmacy. I usually pair the drop with a steroid like Lotemax which can offer immediate relief. I ask the patient to come back in six weeks and generally there’s improvement. Restasis and Xiidra on their own can take several weeks to take effect so using them with a steroid is common practice. Some people don’t want to take medicine or they find Rx drops too expensive, so I jump into supplements. I suggest patients use nutritional products such as a fish oil like Nordic Naturals or a tear drop like EZ Tears. For eyelid-based dry eye, I routinely put in punctal plugs to make tears stay in their eyes longer. Both Restasis and Xiidra offer rebate programs, so patients with insurance need only pay between $30-$40 a month. If they don’t have insurance and have to pay $300 a month, then I suggest Serum Tears. Patients go to a lab to get their blood drawn and centrifuged to separate the blood components. It’s mixed with saline and diluted into a bottle of preserved artificial tears that can be kept in a freezer at home for about $100 a month. I usually find something that will work so finances are not a limiting factor. For many of my mild to moderate dry eye disease patients, artificial tears alone, or in combination with other therapeutic treatments, are often my first line of therapy to minimize visual fluctuations, dryness, and related discomfort. However, the effects of some artificial tears can often be short-lived, only providing temporary relief and require repeated instillations. I have been recommending Rohto Dry-aid to many of my dry eye patients because it has been shown to be fast-acting. It can offer consistent and continuous dry eye relief and can protect the ocular surface throughout the day. This article originally appeared in the January 2018 edition of INVISION. Why tell patients the lenses benefits when several companies now allow you to show them. SALES APPS FOR lenses come in many forms, whether a filter on a popular social media site or a freestanding lens display kit. In January, both Essilor and ZEISS came out with new lens apps. 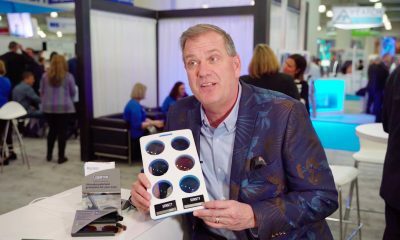 Essilor’s LenSelect helps ECPs demonstrate premium lenses to their patients. ZEISS’ interactive lens demo display comes with an iPad, new app and demo lenses . The app makes recommendations based on the patient’s answers and then texts or emails the practice before an exam. Purple Go is finding some success with its lens pricing app for optical retailers. 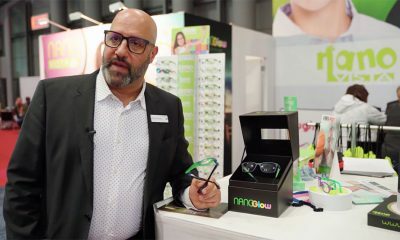 Jeremy Huff, co-founder and CEO, said: “Opticians close sales twice as fast when using Purple Go’s lens pricing worksheet.” Whatever app your lens manufacturer suggests, they all aim to help you sell more lens options. Snapchat filter for ECPs that allows patients to virtually try on different frame styles with Transitions Light Intelligent Lenses. The Lens Display Kit to compare BluTech Ultra indoor lens and BluTech polarized polycarbonate lens. The Transitions SnapChat filter is a very creative way to appeal to the younger generation. I think for a long time there was this idea that only the older generation used Transitions lenses but I love the way the attitude is changing. The filter is a smart way to market Transitions lenses and attract people from all walks of life. 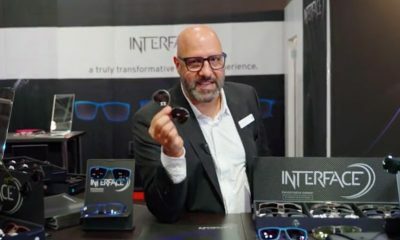 Using technology and a very popular social media app, it has added a hip and interactive spin to the lenses. In addition to showing our patients how to use it, the SnapChat filter is a fun way to also involve my friends and family. I can introduce them to Transitions in a unique way, by including them in the video with me. It’s great that the filter changes sceneries, background music and even the frames and lenses that appear on our faces. We are one of the first beta test sites for Purple Go. I was doing a lot of paperwork and lens options were low. Using the Purple Go app on an iPad over the past 20 months, we can continually offer customized progressives, high index, Trivex and digital lenses all with top-of-the-line AR coatings. We use Purple Go as a tool to review lens options with our patients while taking their insurance and co-pays into consideration. We select their insurance from a drop-down menu to show patients their out-of-pocket expenses. It streamlines the conversation; side by side on the screen they can see how much their co-pay is along with the price for each lens option such as: type, material, treatment, sun protection and photochromic. We then review these costs with them on the screen. While reducing turnaround time and errors for happier patients. FINISHING JOBS IN-HOUSE can be a real bonus for many eyecare professionals. 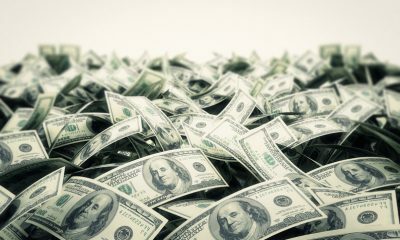 Even though there’s an initial upfront cost to buying a machine, savings can be realized soon thereafter. According to The Vision Council, about 53 percent of all ECP locations have some type of finishing equipment on-site with a further 20 percent owning a surfacing system. There are certainly many efficient and reliable machines to choose from since most manufacturers include retail edgers in their line of lens finishing systems. In 2011, we decided to add an edging lab for better control over expenses and quality. At Vision Expo we chose the DIA from Optek. We’ve been very pleased with this choice. The vertical orientation allows the pressure on the lens to be adjusted during edging. We purchased a second DIA in 2017. We now process over 80 percent of our glasses, which has added substantially to our profitability and patient satisfaction. We’ve been edging in-house for the past 30 years. I had to put in a second machine this year because of the volume. We’re up to about 25 jobs a day on two Santinelli machines, the Me1200 and the LEXCE. We do a lot of custom rimless work which can take an inordinate amount of time. But, it’s hard to find a lab that does good finish work and it’s a no-brainer for me to do it in-house. I don’t look at cost savings but I do look at being able to have ultimate control over our products. We were spending between $8,000-$10,000 a month in lab bills before we got the Briot Attitude in 2016. Now we’ve cut that in half. Even though it’s an expensive machine, it’s paid for itself already. We edge about 30-50 jobs a day through this machine: everything from poly to plastic, high index, single vision, progressives to flat top bifocals. Patients like that we do jobs in-house, especially if they use private insurance.